The challenge of preaching from the Gospels is, in part, the challenge of preaching from narrative. 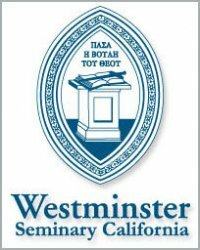 The best of Western seminaries and theological colleges reinforce the cultural bent toward the abstract, and fill students’ heads with the importance of grammatical, lexicographical exegesis. Such exegesis is, of course, of enormous importance. But in students who do not have a feel for literature, it can have the unwitting effect of so focusing on the tree, indeed on the third knot of the fourth branch from the bottom of the sixth tree from the left, that the entire forest remains unseen, except perhaps as a vague and ominous challenge. –The Gospel According to John, (Eerdmans, Grand Rapids: 1991), 100-101. “Have you understood all these things?” They said to him, “Yes.” And he said to them, “Therefore every scribe who has been trained for the kingdom of heaven is like a master of a house, who brings out of his treasure what is new and what is old” (Matt. 13:51-52). We divide this Word into two principal parts or kinds: the one is called the “Law,” the other the “Gospel.” For all the rest can be gathered under the one or the other of these two headings. What we call Law… is a doctrine whose seed is written by nature in our hearts…. What we call the Gospel is a doctrine which is not at all in us by nature, but which is revealed from heaven (Mt. 16:17; Jn. 1:13), and totally surpasses natural knowledge. By it God testifies to us that it is His purpose to save us freely by His only Son (Rom. 3:20-22), provided that, by faith, we embrace Him as our only wisdom, righteousness, sanctification and redemption. (1 Cor. 1:30). According to the Reformed and Lutheran scholastics, law and gospel are actually the means by which the Holy Spirit effects what is promised. “The letter kills, the Spirit makes alive.” “Law” creates terror in the hearer because of the awareness of sin it engenders, while “gospel” actually brings life: “By it, I say, the Lord testifies to us all these things, and even does it in such a manner that at the same time he renews our persons in a powerful way so that we may embrace the benefits which are offered to us (1 Cor. 2:4)” [Beza]. Here it seems to me that we have, as in Ezekiel 37 and Romans 10, an example of a perlocutionary speech act. In the Discourse of judging and justifying, individuals are actually judged and justified. This is amply demonstrated throughout scripture: “This is my comfort in my distress, that your promise gives me life” (Ps. 119:50). “So shall my word be that goes out from my mouth; it shall not return to me empty, but it shall accomplish that which I purpose, and succeed in the thing for which I sent it” (Isa. 55:11). Jesus adds, “It is the spirit that gives life; the flesh is useless.” But he was hardly pitting the Spirit against the word and the ordinary means of grace, adding, “The words that I have spoken to you are spirit and life” (John 6:63). The words spoken are themselves life-giving, not because there is a magical power inherent in a string of utterances, but because of the efficacy of the Holy Spirit working through the faith-creating promise. By this word God actually performs what is threatened in the law and what is promised in the gospel. 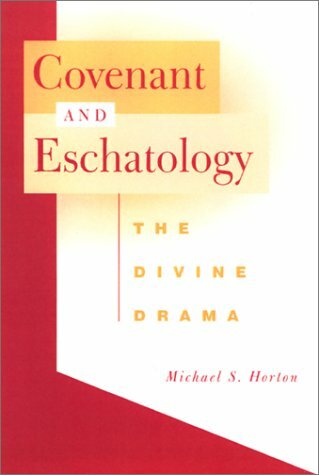 – Michael Horton, Covenant and Eschatology: The Divine Drama, (WJK: 2002), 136. So by hearing the gospel we are actually ‘enabled’ to accept its terms — something we would not be able to do if the gospel itself doesn’t ‘do’ something to us when we hear it. That is why we need to hear the true preaching of the gospel, not just when we first believe, but every week and for the rest of our lives. For this is the ordinary means by which God makes us continually alive to himself, and preserves us unto eternal life. Let us never tire of hearing that word of good news. For, “The words that I have spoken to you are spirit and life” (John 6:63). Calvin talks about how preachers ought to ‘paint’ Christ in their sermons so that hearers don’t feel like they need any images. Let those who would discharge aright the ministry of the gospel learn, not merely to speak and declaim, but to penetrate into the consciences of men, to make them see Christ crucified, and feel the shedding of his blood. When the Church has painters such as these, she no longer needs the dead images of wood and stone, she no longer requires pictures; both of which, unquestionably, were first admitted to Christian temples when the pastors had become dumb and been converted into mere idols, or when they uttered a few words from the pulpit in such a cold and careless manner, that the power and efficacy of the ministry were utterly extinguished. How is the Kingdom Coming? How does the kingdom of God actually come to us? How does it advance in the world? This is an important question, I think. And it raises the following questions as well: Can we see signs of the kingdom’s coming? Ought we to look for them? Will they come through the news headlines? In Scripture we are told to pray, “Your kingdom come, your will be done.” But can we have any evidence, any tangible sign, of God’s kingdom actually advancing in the world? Can we even have a small glimpse of its coming? If so, where are we to look? The manner in which the demons respond to Jesus shows his authority over them, but it is not just a raw power: it is his coming in his kingdom of grace and forgiveness that they fear most. Satan and his emissaries are busiest not with plotting wars and oppression–these are symptoms of the sinful condition that human beings are capable of generating on their own. However, Satan knows that if the Messiah fulfills his mission, the curse is lifted, his head is crushed, and his kingdom is toppled. All of Satan’s forces are deployed in this last battle for “all authority in heaven and on earth.” all of Jesus’ miracles are pointers to this saving announcement; they are not ends in themselves. The kingdom comes with words and deeds. In the miracles, it is said that Satan has bound these people. Christ is breaking into Satan’s territory, setting history toward a different goal, bound to his own rather than to demonic powers. This is why Paul’s call to spiritual battle in Ephesians 6 identifies the gospel, faith, the Word, and Christ’s righteousness as the armor and weapons. Satan’s energies are now directed against the church and its witness to Christ. The devil knows his house is being looted and his prisons are being emptied as the gospel is taken to the ends of the earth. Broken sinners leap for joy at these words while all hell’s angels flee in terror. And they must flee because in these words is announced the demise of their master. Christ has crushed the serpent’s head and the gospel merely announces this reality so that the whole world can hear of it. And we who hear these words rejoice that Christ our saviour and king is the victor and that our blessed inheritance in his eternal kingdom is now a most certain and glorious reality. Today, even in Reformed and Presbyterian churches, I believe there is considerable confusion and misunderstanding about what preaching is. Often, this comes in the form of preachers giving sermons which sound very much like Sunday-school lessons or bible-study lectures. One might here a lot of truth (even about Christ and his grace) but won’t hear Christ himself. Indeed, it alarms me to conisider how often words about Christ might be present, while the very Word of Christ is absent — that very word to which (alone) are attached the very precious promises of God. What do I mean? Let me try to explain. Does teaching = preaching? Or is there a qualitative distinction? If someone gives a lecture about the nature of the atonement, does this qualify as preaching? And yet if we agree that preaching includes teaching, is preaching really something altogether different? These are good questions, and important ones to be asking for sure. 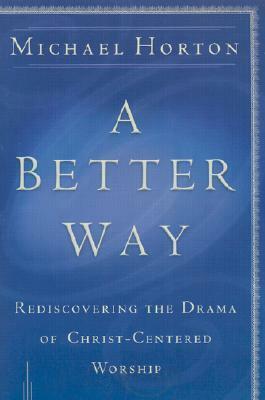 Here I’ve quoted at length from Michael Horton’s book, A Better Way, on the topic of the preached word. A sermon is not only an exposition of God’s Word but is itself God’s Word. It is the Son of man preaching life into the valley of dead bones, wielding the two-edged sword that kills and makes alive. It is the Holy Spirit alone who is the effectual cause of the Word’s work, but it is administered through preaching…. Sometimes we see the sermon merely as an opportunity to make the Word effective. For some, it is an opportunity for mere reflection–data processing, to put it indelicately. For others, it is a chance to make a decision. Still others see it as a stimulation to emotional experience. But whether we make our intellect, our will, or our heart sovereign, we are exchanging the glory of God for that of the creature. As Scripture presents it, the Word itself–wielded by the heavenly agent (the Holy Spirit) and the earthly ambassador (the preacher)–does what it threatens in the law and promises in the gospel. The Word itself does this work, not because it provides an occasion for us to do something but simply by its being used by God according to his own sovereign will. It is not just the content of the Word but the preaching of the Word that is central in worship and is, strictly speaking, a means of grace. This is a gigantic distinction. This means that when a minister ascends the pulpit to preach, his task is not merely to offer certain truth claims to his hearers, or to exhort them to believe more strongly. But rather more specifically (and simply) it is to proclaim and announce a specific message of good news even to those who might have heard it more times than they can remember. Here in lies the real challenge of the preacher. His job as under-shephard and feeder of God’s flock, is not to feed them with whatever whimsical concoction his hermeneutical and homiletical wizardry can cook up. Rather, it is to faithfully serve up that menu which Christ (as the over-shephard) has prepared for him already — namely the message that Christ has accomplished all of our redemption for us who believe. And as he proclaims this very (specific) message, God the Holy Spirit works according to his good pleasure to strengthen, establish, and confirm his saints in the faith. In this way, Christians’ hearts are washed, their doubts quelled, their faiths built up, and their souls nourished — all by the very word of Christ by the power of the Holy Spirit through the ordinary means of a mortal preacher. Furthermore, this means that when we come to worship God on Sunday and hear the word proclaimed through the preacher, it is not merely the voice of a mortal man we hear, but the very Word of God being announced to us. It’s not as if the preacher can say whatever he wants. And likewise, it’s not as if we can listen to him as if he were just another guy. No, God (in Christ) has commissioned his minsters for the special service of speaking Christ’s very words for him so that we could actually still here Christ’s voice today — even two-thousand years after his ascension. What really is true preaching? Is it basically teaching on doctrine? Or is it moral exhortation? What’s the difference? Preaching is not merely the minister’s talk about God but God’s talk–and not just any talk. It’s the kind of talk that produces a new people. It is the encounter through which God himself takes the judge’s bench, arraigns us as sinners by the standard of perfect justice, and then finds a way, in Jesus Christ, to be both just and the justifier of the ungodly. All of this happens to us before our very ears. It is worked upon us and in us by the Holy Spirit as the Word is preached (and is confirmed visibly for us by the sacraments). – Dr. Michael Horton, A Better Way: Rediscovering the Drama of God-Centered Worship, (2002), p. 38.